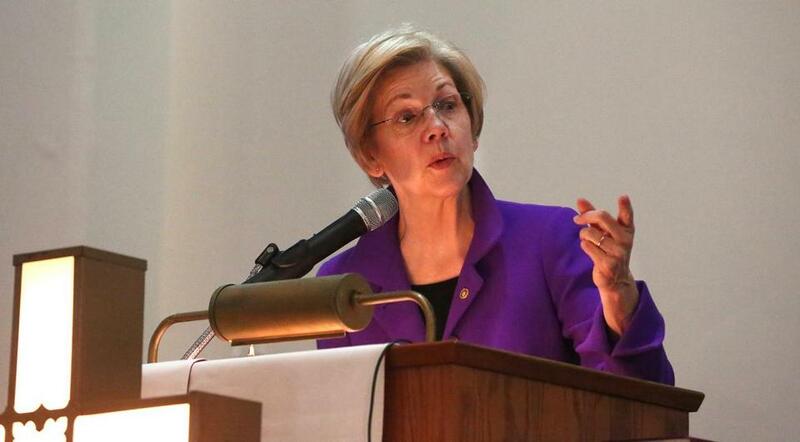 Senator Elizabeth Warren spoke Sunday at a Boston church. For Republican leaders in Massachusetts who are trying to find a credible candidate to challenge Senator Elizabeth Warren, the timing couldn’t have been worse. The image that has dominated the front page and TV news in recent days was devastating: Senate majority leader Mitch McConnell silencing Warren as she attempted to read a letter on the Senate floor written 30 years earlier by civil rights icon Coretta Scott King. The dramatic blow-up in a late-night Senate session came just as the Massachusetts GOP is holding conversations with potential candidates to run against the state’s senior senator in her first reelection bid. And McConnell’s attack only reinforced Warren’s iconic standing among Democrats, both across the nation and among her Massachusetts constituents, who consider her one of the party’s most effective voices to counter Donald Trump’s presidency and to battle the Republicans in Congress. “McConnell made it a bigger story, and in a political atmosphere that is already turbo-charged it clearly enures to her benefit,” said Democratic Representative Richard Neal, the dean of the state’s congressional delegation. The uproar also underscored the political volatility that will drive next year’s Senate race. The fate of a Republican challenge to Warren will likely hinge less on political currents in the state than on the turmoil in Washington. To beat Warren, the Massachusetts GOP must convince voters that sending Trump another Republican senator is good for the state — a high hurdle if the electorate remains energized by Warren’s role in opposing the new president. “Voters in this state will vote for a senator in 2018 who will clearly and unequivocally stand up to Trump and support Massachusetts values,’’ said Doug Rubin, a Democratic consultant who worked for Warren in 2012. One senior Massachusetts Republican operative called the Senate dustup “a giant miscalculation” on McConnell’s part. “It has really set us back in our recruiting,” he said. But state GOP chairwoman Kirsten Hughes said Warren is creating too much division with her attacks on Trump and congressional leaders, while failing to look after the state’s interests. It’s a likely theme of any Republican campaign against Warren — and one that her team protests. “Senator Warren is using every tool she can to rebuild economic security for our families and make a difference for Massachusetts,” said press secretary Lacey Rose. She cited Warren’s efforts on a range of issues including protecting students from fraudulent for-profit colleges to securing disaster relief assistance for fishermen. While Trump is hugely unpopular in the state, his supporters show little inclination to run a Senate campaign that distances itself from the president. Holly Robichaud, a Republican strategist working with state Representative Geoffrey Diehl, a potential Warren opponent, indicated that if he runs, he will make Warren’s outspoken attacks on the president and Republican congressional leaders an issue. Republicans have tried a similar tactic before: In his high-stakes 1996 race against then-Senator John F. Kerry, Republican William F. Weld argued that with the GOP in charge, Massachusetts needed a Republican in its congressional delegation. Robichaud also brushed aside suggestions that McConnell’s shutdown of Warren on the Senate floor worked in Warren’s favor. “A lot of people . . . recognize that what she did was a big no-no,’’ Robichaud said. Other state Republicans argue that Warren, a polarizing figure, has created a significant bloc of enemies, both in her home state and across the country, forces that are eager to see her challenged. They point to a recent survey taken by the nonpartisan MassINC Polling Group that suggested a dip in her popularity, a key talking point they use to make their pitch to potential candidates. The survey found 46 percent think someone else should be given a chance to be senator, while 44 percent want to give her another term. Republicans say financing would be no problem, despite Warren’s reputation for prodigious fund-raising. Money will pour in from GOP conservatives across the country, the National Republican Senatorial Committee, and Wall Street — all eager to support any challenge to Warren. Even the Trump White House, believing she could be a potential opponent in 2020, would take an interest in making her reelection a major problem for her. ■ Diehl. As Massachusetts cochair for Trump and at times a thorn in the side of the party establishment and the GOP on Beacon Hill, he would have strong appeal to anti-Warren passions. As a state leader for Trump in 2016 when others including Governor Charlie Baker backed away from the GOP nominee, Diehl was able to build an infrastructure among the state party’s conservative wing that would strengthen his hand in what could be a contentious Republican primary. ■ Rick Green. A wealthy Pepperell businessman, he has financed a nonprofit group that promotes conservative fiscal polices, Massachusetts Fiscal Alliance. He is known in party circles, having made a strong run for chairman several years ago. He is more moderate than Diehl and chaired Ohio Governor John Kasich’s presidential campaign in Massachusetts. He is more attractive to the Baker wing of the party and could be seen as a perfect fit to be on the GOP’s 2018 ticket with the governor who will need many independents and Democrats for his reelection. ■ Former Red Sox pitcher Curt Schilling. Schilling has star power but no experience in the complicated art of politics and campaigning. His lack of discipline, which could appeal to the Trump and Tea Party factions of the GOP, would be a tough sell in the general election. He is also good friends with Diehl and may not want to run against him for the nomination. ■ Lewis Evangelidis. The Republican sheriff of Worcester County and a popular figure in the party has also shown interest. ■ Gabriel Gomez. The GOP’s US Senate nominee in the 2013 special election, he has prompted speculation he may return for another try. ■ And some potential outliers, such as Allen Rodney Waters, a Mashpee businessman and self-described “angry conservative black man with a chip on his shoulder.” Waters talks of running a slash-and-burn campaign — even challenging Green to spend all his money, saying it would go up in flames. “Burn, baby, burn,” he said in an e-mail to the Globe.